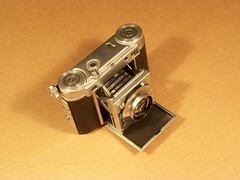 The Dollina is a series of 35mm folding cameras produced by the German maker Certo based in Dresden. There were three generations of Dollina, each with a different body. The Dollina II was a more expensive version, with a coupled rangefinder unit above the top plate. 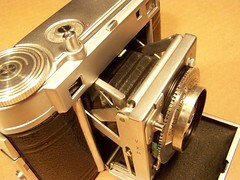 It is operated by the top focusing knob, and the viewfinder and rangefinder windows are separate. The Dollina II existed in black finish (earlier version) and in chrome finish (later version). 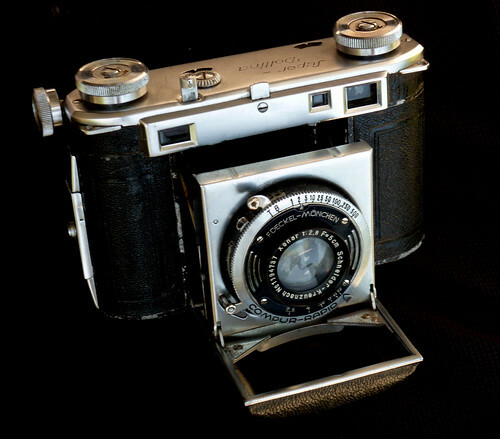 The Dollina II was a mid priced camera; in 1938, a Schneider Xenon lensed model sold in New York for $57.50 US, or about $859 Us in 2007 terms. This was about half the price of a Xenon lensed Retina II or Weltini. 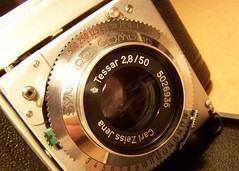 The shutter was either a Compur 300 or a Compur-Rapid 500. 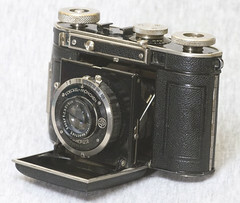 1936---- Dollina ll rarer version:Smaller rectangular window and smaller circle in Rangefinder: NO serial # Very Rare! Tiny rangefinder windows incorporated in the baroque shaped body, below the flat chrome top deck . Three large knobs on top of equal size, focus is in the center, large plunger rod shutter release, large film counter reset on top deck. Distinct angled forward shaped 45mm thick body, 115mm wide, 580.97g weight ( Heavy- Brass). 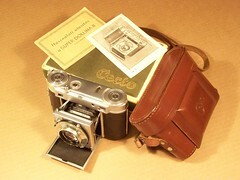 Camera is stamped with" Dollina" large letters, Certo Dresden in small letters. Two small viewfinder windows on the left side back. The Dollina III was short lived and replaced by the Super Dollina, and today it is the most uncommon of the Dollina models. The Super Dollina II was in production for a very long time, until the beginning of the 1970s. It was also sold under the name Super 35.